After enjoying the White Chocolate I had from Green & Black's a couple of months ago, I now find myself reaching for more white chocolate. 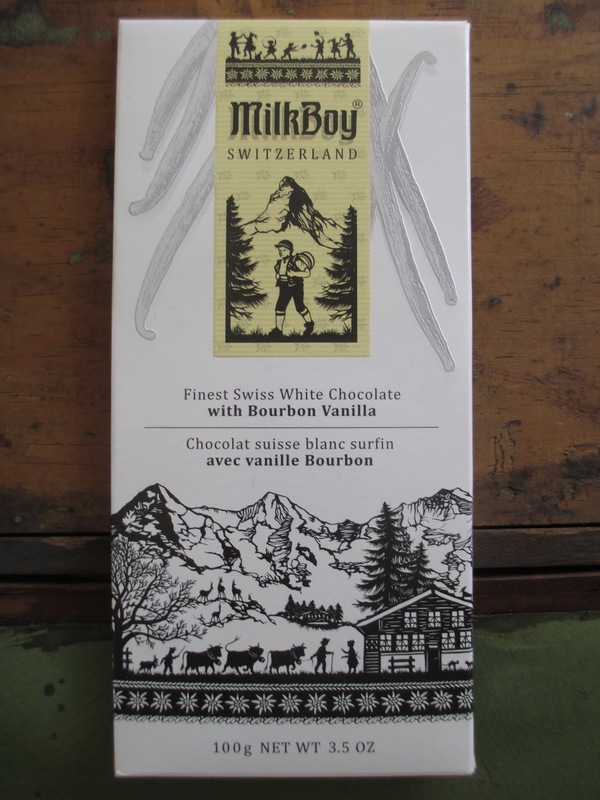 World Market is currently selling a couple of bars from the Swiss brand MilkBoy. It's nice to see this brand there simply because World Market lately sometimes seems to be selling less foods from "around the world" than I think they should, given the store's name (this is one of the reasons why I don't review their store brand: that isn't the type of product I want to buy from them). I've never seen MilkBoy before. I was also fairly unfamiliar with the UTZ Certified label on the back; it apparently denotes "sustainable cocoa farming." But what does that mean? After reading briefly on this type of certification, I found that not only does it require certain standards as far as the environment goes but also as to the living conditions of workers. Sure, it looks like it has its problems (what certification doesn't? ), but it had me at "no forced labor or child labor." That's what I ask from cocoa products. When I brought out the gold foil-wrapped bar, I was pleasantly surprised at how pretty it is. Eight squares come complete with decorative edges and a cocoa pod in the middle, half of them shut and half of them opened up to show the seeds/beans inside. And yet, I shouldn't have been surprised because the design of the card box on the outside is nice, as well. The silhouette artwork comes in simple black and white, celebrating traditional images of Switzerland; the space is filled without feeling cluttered. The surface of the chocolate looks standard for a vanilla white chocolate (specifically, this is Bourbon vanilla): dark specks scatter across creamy white. The aroma is pretty buttery. If I'm comparing to Green & Black's, then it's important to note that their white chocolate has 30% cocoa while this one only has 26%. As far as taste, though, I can't say much: I would have to have the two side by side in order to really compare them. The thing about white chocolate is that its flavor is simple enough that, unless it's bad, there isn't much to remember in particular once it's gone. This isn't a criticism; it's just a fact. There is less to taste. What I can tell you is that I seem to have talked a lot about the vanilla flavor of the Green & Black's chocolate, but I don't feel like the vanilla here is particularly strong. Yes, it's there, but I'm describing this one as tasting primarily buttery and milky. Interestingly, though, I also find it more buttery and milky than sweet--and I did call the Green & Black's white chocolate very sweet. So perhaps the two white chocolates are rather different, after all. I still have that feeling of vanilla ice cream without the ice. And I still don't find this chocolate chalky. That makes me wonder if white chocolate isn't really chalky, after all. Maybe I had memories of cheap white chocolate that was chalky that made me think it was all that way? Or maybe white chocolate is so scarce that in my earliest memories of it, I was so unused to white chocolate that I found it chalky just compared to whatever other chocolate I was used to eating at the time? Hmm. 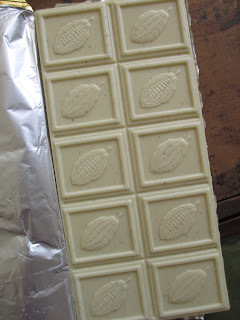 My first memories of white chocolate. I remember eating white chocolate alligators that we got at the white alligator exhibit at the zoo. Later, there was the Cookies & Cream bar from a set of Ghirardelli bars that came in a blue velvet bag (a bag that I still have, twenty years later). Those two instances are all I can think of: any other "white chocolate" I came across was probably that "candy coating" that sometimes gets called white chocolate when it really isn't chocolate at all. Setting aside my white chocolate memories and returning to the chocolate, I find myself wondering again why white chocolate isn't more popular. It's incredibly easy to eat, being sweet and creamy and lightly rich, while also straightforward and simple in flavor. 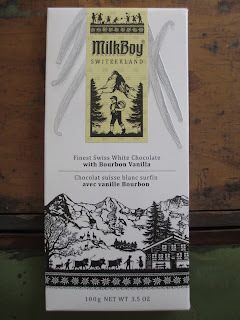 I am also curious how MilkBoy's milk chocolate tastes. It would be interesting to see what I think of the milk chocolate after first tasting the white chocolate, or if that particular order of introduction to a company's products affects my perception of the company's style.